This weekend just past, we had the opportunity to see the effects of poor city planning. Santa Cruz has maintained and gentrified its city centre, but on its fringes it has fallen down on the job. As Santa Cruz stretches south toward Capitola it’s a land of strip malls, oversized homes on undersized lots, and mobile home parks. The names of the mobile home parks are amusing: Shangri La Estates, Castle Mobile Park and so on. The pretension is exceeded only by the number of these parks. They are in residential and commercial areas. There seems to be no regulation at all: they’ve popped up everywhere. Capitola, on the other hand, is the capital of kitsch. 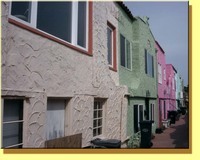 There are groups of rental properties and motels near the beach that are multi-coloured products of many imaginations. Are they meant to be an Italian village? Are they painted different colours to distinguish one from another? The buildings have reliefs of mermaids, mermen, and seagulls. 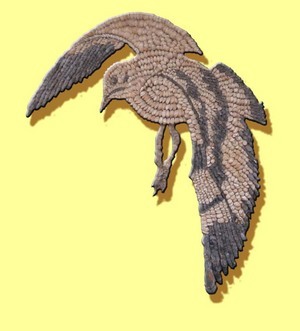 This seagull is made of shells: mussels and clams, I think. Somehow, when people get near the ocean, they seem to let their imaginations go wild. Is it the sun? Is it the surf? Is it just feeling of being cut loose from the constraints of everyday life? People will buy, and wear outfits that look like they come with a volume control and live in houses that outshine the sun. Maybe it’s just a moment when people can cut loose and not have to feel embarrassed because the only people who see them will never see them again. You can stay in a little pink house and wear an outfit covered with pink flamingos and no one back home will know. What happens in Capitola, stays in Capitola. Then there are those who bring it home. This person decided that “a man’s home is his castle,” was a home truth. 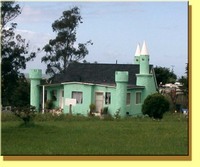 So, here’s his castle on Highway 1 near Moss Landing. Not only did he make a mini-castle, he painted it an eye-popping green. I could go on, but ‘nuff said. I am Bean, hear me roar! We arrived a day early for Bean’s christening. There was an Easter egg hunt at the beach (yeah, only in California), so we took Andie and her basket. The Easter bunny and the rest of the world were there. Andie got some lap time and 3 eggs (the limit). Grams couldn’t take the crowd. She is too weird sometimes. 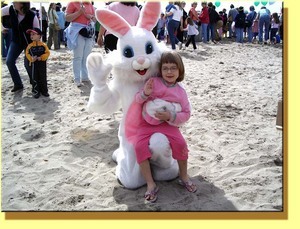 I got this picture of Andie with Peter Cottontail. That night Henri arrived from New York and we all rested up for the big day. You’ll notice the look on Bean’s face as looks at his dad: “They’re going to do what? Dad, Dad, you got to help me escape!” Andie poured the water in the font. 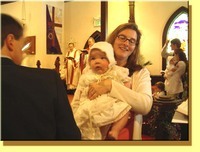 Henri had done that for Andie’s christening 5 years ago. Bean actually did great until it got to the third dunk, the Holy Ghost got him and he let out a scream that was heard to the Canadian border. Well, if the spirit moves you . . . In the afternoon, we went to the boardwalk. Henri and Andie rode the boats, and dragons, and all sorts of rides. They played in the game arcade. Even Grams got into the act: here’s the evidence. 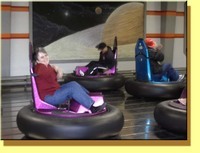 Grams loves bumper cars. I think because it’s the only kind of car she can drive and worry about hitting things. A gale moved in, the sea churned up and we looked liked drowned rats, but we had big smiles on our faces as we headed back to Andie’s house. After dinner, Grams read a story to us and we all toddled off to bed. We have a favourite restaurant that we like to eat at when we’re going up the central coast of California. It’s located in King City, a town known for its produce. It’s called, Keefer’s, and we’ve been stopping there for years. There’s a restaurant and a motel next door. The food is good and with a homemade taste. The waitresses call you, “Honey.” Grams’ favourite thing is the gift shop. Big Guy’s favourite is the Cobb salad, and mine is the fruit salad (that and the way the waitresses fuss over me). So, as we pulled off the highway yesterday for lunch, we were looking forward to our regular Keefer’s meals. The first clue that we should have known something was amiss was the billboard for a new diner a few miles before, but we paid no heed. Then, as we pulled into the parking lot, Grams said, “Look there’s that diner sign, it’s not Keefer’s anymore!” “No, no, look, there’s the 'Keefer’s Inn' sign,” said Big Guy. But, as we got closer to the front door we saw a big diner sign. Looks were exchanged. Brows were furrowed. Once inside, the place looked the same. The gift shop was still there, much to Grams’ relief. The waitresses were still the same, much to my relief. The menu, however, had changed. I thought Big Guy’s eyes were getting teary as he searched in vain for the Cobb salad. I’ll admit to shedding a few tears over the lack of a fruit salad. With heavy hearts, we ordered our meals. Then Big Guy said, “look! The mural is still there!” We turned around and Grams looked at me and I knew what she wanted. 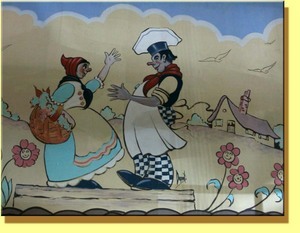 I got the camera out and she took these photos of the famous Keefer’s mural. It’s wonderful and silly. It was a large part of the reason that the food tasted so good, I’m sure. We ate our meals morosely. The fresh green salad was quite good, but poor Big Guy didn’t enjoy his meal at all. He had spent the better part of 50 miles thinking about that Cobb salad. We did find out that the mural will stay, as will the waitresses. Gweeds is on the road again. We are on our way to Bean’s christening. As we drove through the central coast of California, I took a few pictures. It was a beautiful day. There are fewer cattle these days and more vineyards. Sometimes they go as far as the eye can see. The rich soil of Salinas valley is as beautiful as ever. Grams is forever saying that it looks like dark chocolate. Everything is on a chocolate scale to her. 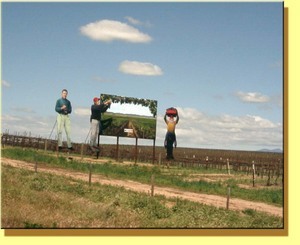 The giant signs are around Salinas. We love them. Some are truly funny, on purpose. Grams just about screamed when se saw this one. Big Guy grumbled, but he stopped. We had to run back a ways to get this shot. 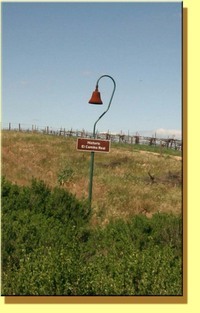 The bells of “Historic el Camino Real” are supposed to be like the mission bells and follow the route of the padres as they founded the missions. The bells are rusting after just a few years and the road doesn’t follow the Camino Real exactly. But, hey, it’s the thought that counts. Right? Last summer Henri, Grams and I went to see the Monarchs. 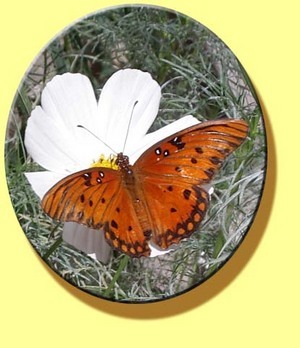 Well, the Monarchs, and the Blue-Tailed, and the Celadons, and the Zebras: butterflies all. It was an exhibit at the Natural History Museum. Every summer the museum mounts this exhibition in a netted area outside by the creek. Living on the central coast of California, we usually get to see the Monarchs every winter in any of the many eucalyptus groves near the ocean. It’s an interesting thing about the eucalyptus trees; the eucalyptus is not native to California. It comes from Australia. So, how did they get to California? It all has to do with Messrs. Huntington, Crocker, Hopkins and Stanford. You see, in the 19th century they founded the Central Pacific Railroad. They needed a wood for the sleepers (ties) on the rail line. They needed a wood that was hard and would grow fast. Eureka! They imported eucalyptus trees and planted them all along the California coastline. 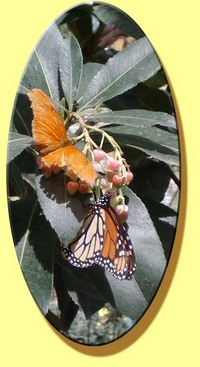 Lucky for us, the Monarchs like nothing better in the winter than to go to the eucalyptus ‘fly-in-park-and-morph’ hotel. The rest of the year, they thrive on milkweed, but in the winter they crave the eucalyptus. Call it propinquity, but the robber barons who built the railroad have created a series of havens for the Monarchs. It’s that yin and yang that makes life interesting. 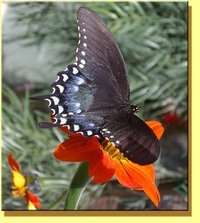 The butterflies live for two to six weeks. When Grams found this out she leaned over a Monarch and recited, "Do not go gentle into that good night" all the way through. The woman is a little different, she never ceases to amaze me. Wonder what the butterfly thought. Spring was just making its appearance in Beddgellert when we arrived. Marian and Emlyn had brought us here because of a phone call they had received from Grams a few weeks before. Grams listens to BBC Radio 4 on the internet everyday. She’s a major ‘Archers’ fan, but she also gets the UK news. One day in the late winter the big news on Radio 4 was the gale that was battering Wales. Especially hard hit was the town of Beddgellert. The river had overflowed its banks and was flooding the town. The report from Beddgellert was breathless. Grams picked up her mobile and called Marian and Emlyn. After assuring her that Beddgellert was nowhere near them, they decided that she and Big Guy would have to see Beddgellert when they came to visit a few weeks later. So, as the daffodils bloomed we pulled into Beddgellert. Now I’ve told you the story of how Beddgellert got its name before, so I won’t go into it now. What was astounding to me was how peaceful the town looked after being ravaged just a few weeks before. The few signs of the damage were hard to find. The raging river was now a peaceful stream. How could any harm come from it? How sublime, how treacherous. Today is Henri’s birthday – he’s into double digits now. Happy Birthday Hankster! And cast sweet fragrance round. No discord here is found. 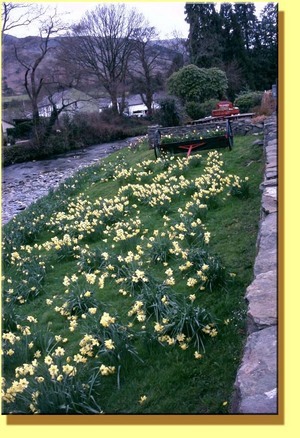 It was early spring in Wales. The sun was shining and Emlyn suggested an outing at the Welsh Slate Museum. It’s up in the mountains of Snowdonia. As we drove up the road we could see the slate mountain. The tailings from the slate cover the side of the mountain. The museum is not a ‘museum’ per se. These are the actual buildings that were part of the mine during its existence. We walked through looking at everything. It is as if you’re walking back in time, as if the last miners just left their shift. 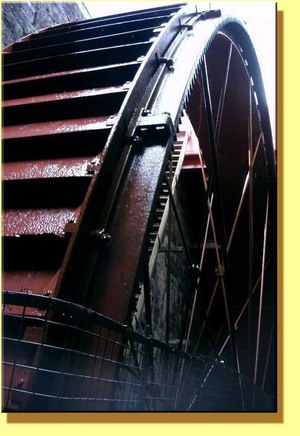 The largest working waterwheel in Britain is there. This picture doesn’t do it justice: it’s huge! We saw a retired miner give a demonstration on how to split the slate. There was also a 3-D movie called, “To Steal a Mountain” that showed the everyday lives of the quarry workers. There was a restored home of a mine manager. It was smaller than I thought it would be, especially after seeing the estate of the mine owner on the way to Anglesley. The Welsh miners worked themselves to death for the British mine owners. The wealth flowed in one direction: out of Wales to Britain. The only sign of the bounty of the mines in Wales were the estates that the mine owners built for themselves. 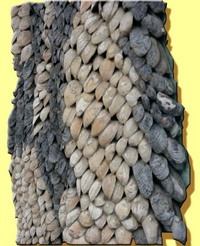 The walls around the estates are topped with pieces of slate. If you think of each piece of slate as being dug up by Welsh miners in badly ventilated mines, receiving poor wages, having no medical plan and working long hours; then the pieces of slate become a sad memento of a harsh time. The museum is not an unhappy place today only because Wales is so different today. The Welsh have kept their language alive and are succeeding as they never could before. They have their own Assembly and are in charge of their own affairs. Wales has taken back its own. So, this look into the past is more nostalgic than anything else. Big Guy and Grams were surprised as we were leaving the Colosseum when I said, “Let’s go see the Forum!” They didn’t realize that the Forum is just next door. So, off we went. We came in at the middle of the site and just wandered around. Grams had the guide book, but we were all gobsmacked by the juxtaposition of the large scale and the intimacy. It is enormous and at the same time, because everything is so higgely-piggely all over each other, it has an intimate feel to it. There are also some great stories being told on the buildings and monuments. Here is the Arch of Titus. It was erected by Domitian and it celebrated the victories of his brother (drum roll, please) Titus. It tells the stories of the battles that had taken place a decade before in Jerusalem. These stories were important for the culture and since people back then weren’t always literate, the stories were often told with pictures. This is a lucky thing for us, since it allows us to see much about how people lived back then. It also shows us how they saw the world and themselves in it. If you click on the picture, you can see the incredible detail of the Roman legions in carrying off the booty from battle. At the top of the arch, Domitian proclaims the exploits for the greater glory of the Empire. It hit us all at the same time how vainglorious empire can be. We can see the Roman Empire at the height of its glory at the Forum, but we can also the end of the empire in the same place. Sic transit gloria mundi. One last thing: Caesar wasn’t stabbed at the Forum, the dastardly deed was down the street. 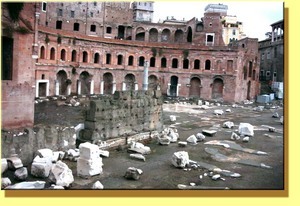 Trajan’s market was built by around 100 AD by the Emperor (drum roll, please) Trajan. The coolest thing about it is that it’s very much like a modern mall. See, there’s really nothing new under the sun. We went to see Trajan’s Market on a Sunday after having been to the Forum and the Capitoline museums. The road between them that goes down to the Coliseum is closed on some Sundays. Suddenly, we could come and go at will across this usually busy street. So, off we toddled to look at Trajan’s Market. 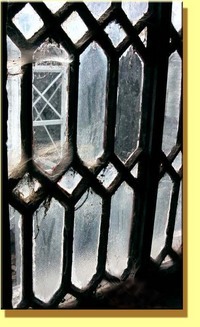 It is still being excavated and restored. It was a bit like an arcade with small shops off of long corridors. Grams liked this tile. She was amazed that it was still there. I was impressed with the drain in the floor. That meant that there were pipes that carried away the water. Once, a long time ago, I read that the sign of an advanced civilisation is access to potable water and sewers. I wonder if that’s simple, there must be more to being civilised than that. 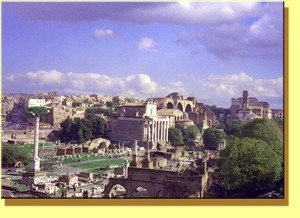 When Trajan’s Market was built it was considered one of the wonders of the world. What I thought was interesting was the practice of doling out free corn to the citizens of Roma from the top floor of the Market. The free corn kept Romans from starving in lean times. Probably it also kept the Emperor from being turned out by hungry mobs. At any rate, it was an early form of ‘entitlement,’ and reminds us that governments benefit from helping the populace as much or more than the people benefit from that helping hand. Or, we could say that everything we know we learned from Caesar (Grams says everything she knows she learned from Sid Caesar). We stopped on this bridge over the Tiber looking west to take in the view. The water was so still that the bridge made a perfect double of itself. Ah Roma! Before we went to Roma the first time, Grams’ Mum said that we had to go to the Original Alfredo Restorante. She couldn’t remember where it was except that it was near the Spanish Steps. She had been there 30 years earlier and had fond memories of it. Grams was determined to find it. We went to the Piazza di Spagna(where the Spanish Steps are). Looking around we didn’t see anything Alfredo. Then Grams spied the American Express office, “You boys wait here, I'll go ask at the Amex office, and off she ran. I took this picture of Big Guy waiting by the fountain in the Piazza. A few minutes later, Grams came running back. “I’ve got it! We walk over to the Via della Croce turn left, and when we get to the end of it, just dog-leg off to the right and go straight ahead and ‘Bob’s your uncle’ you’re there! I have to admit it: she was right. We entered the restorante and there was an immediate feeling of being welcomed. The waiters and staff all wanted to wait on us. Everyone wanted a picture with me. They made me feel like a celebrity. The interior of the restorante is an ode to the Art Deco movement. It is amazing. When we weren’t taking pictures of me, we were just gobsmacked by the décor. 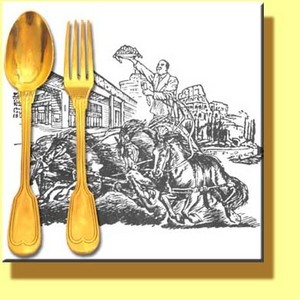 When my plate of Famous Fettuccine Alfredo pasta arrived, it came with the gold flatware that Mary Pickford and Douglas Fairbanks gave Alfredo back in 1927. Not everyone gets the gold flatware - I was honored. We toasted Alfredo and Mary and Douglas with several glasses of wine. The Fettuccine Alfredo was fantastic. Grams has come close to recreating it, but to have the Originale Afredo can’t be beat. During the midst of the festivities, a phalanx of security people arrived. There was one fellow who had on a loden green duffle coat and Grams elbowed me and whispered in my ear, “Gweeds, he’s got a gun under that coat!” I almost spit out my wine. After the security people had searched the place, they went back outside and brought in a man and woman and teenage girl. “I know who he is,” said Grams, “he’s the U.S. Ambassador to the Vatican.” Just then the owner came over for his picture. When we finished up, I whipped out my gold card. The gold card always get folks excited, can’t figure out why. Then, Grams looked up: the Ambassador was motioning us. She pointed to me. He nodded, yes. “It’s a long story,” she said smiling. “So, cut to the close up,” he replied. We toddled over to his table. Grams told him and his family the story of how we met. Then, he noticed my little red, white, and blue ribbon pin that Grams’ friend Masaye made for me. “I have something for you!” he said. He started searching through his pockets. His wife started going through her purse. “I know where there’s one!” he said and jumped up. He ran past the phalanx of security out to his car. A minute or so later he returned, beaming, carrying a little pin. It was an American flag crossing a Vatican flag. “I had these made up!” he said as he pinned it on my shirt next to my ribbon pin. “I’ll wear it forever,” I said. And I have. It’s still on my shirt, next to my ribbon pin. Drop fettuccine into water and cook until fettuccine comes to the surface (approximately 2 minutes). Drain and place in a warm bowl in which half the softened butter has been placed. Top with lumps of remaining butter and cheese. Toss lightly (2 minutes) until fettuccine is well coated and a creamy sauce has formed. Add pepper and additional cheese. Serves 4.